Happy Thursday, are you ready for the long Holiday Weekend? 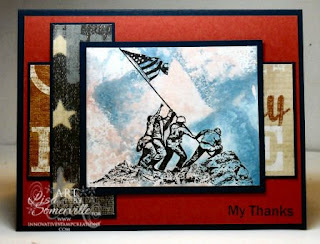 Over the next few days, I'll be sharing more cards with patriotic themes, so be sure to check back! Kerry and I were thinking alike when we issued challenges to our teams this week - of course with the 4th of July being on Saturday, we both chose Red, White and Blue. .
For my card, I stamped the solider image from Innovative Stamp Creations Memories of Patriotism in Black Archival on White card stock and let dry. I used Tattered Rose and Faded Jeans Distress Inks for the Watercolor Distress Technique, it reminds me of a swirly sky. The DSP is Karen Fosters Stars and Stripes, available at ISC, or when your purchase the MOP Kit. My image is stamped clearly, but for some reason Blogger always seems to have issues with Red card stock when there is a stamped image. Click to enlarge - it reads My Thanks. Lisa, this card is soooo gorgeous! It's one of those that really tugged at my heart. I love it! What a great card. It really has a wonderful patriotic feel. The background is just perfect. WOW,I love that background technique. I've got to start trying some techniques. Your card is stunning. Another fabulous card. I love the stamp and what you did with it. Way to go girl! WOW! this is fantastic! Thanks!